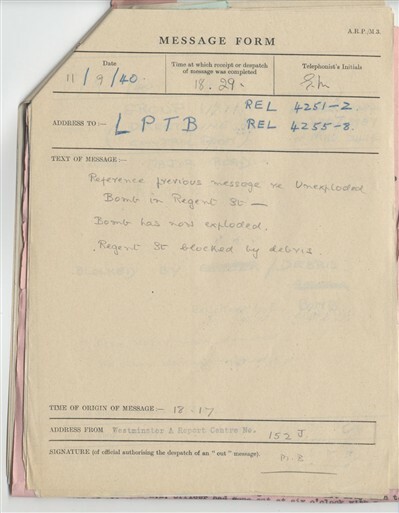 At 3.14am on 11 September 1940, incident messages sent to the City of Westminster ARP Report Centre, St Martin's Place, confirmed the presence of a large delayed-action bomb lying unexploded in Regent Street W1. 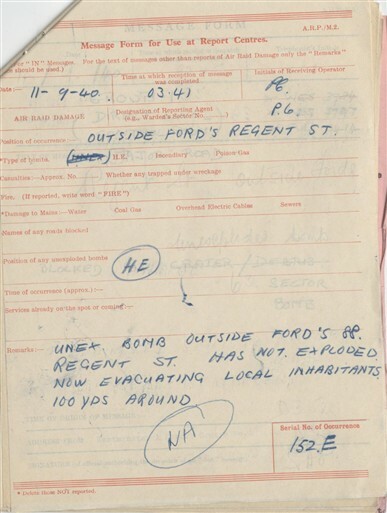 The high explosive bomb had fallen at the corner of Regent Street and Glasshouse Street and was lodged in the roadway between the Austin Reed fashion store at 91 Regent Street and the Ford car showroom at No 88. It was cordoned off with rope by police officers and residents were evacuated 100 yards around the site of the impact. Unlike most unexploded bombs (which tended to bury themselves into the ground upon impact) this one remained in full view. To make the bomb safe for removal, a team of Royal Engineers (assisted by government scientist Dr Arthur Merriman) arrived later that morning to drain the highly poisonous explosive material inside, in the hope of deactivating it before it could explode. In order to accomplish this they used a device to steam off the explosive mixture inside the bomb. Two rubber tubes were affixed to the bomb, separated and snaking down the street in different directions. On the end of one tube the steaming device was attached while the other formed the receiving end. It was a slow process. All the while the bomb remained active and ready to go off at any moment. 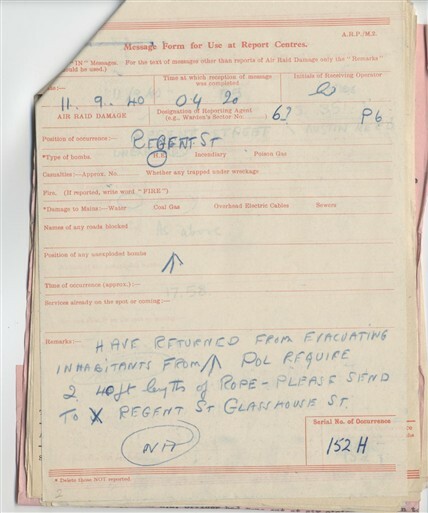 Dr Merriman and the Royal Engineers team managed to reduce the power of the bomb substantially but failed to prevent detonation. At 6.15pm the bomb exploded. It had been walled by sandbags in anticipation and so damage from the resulting blast was limited. Nevertheless, many plate glass windows in nearby shops were blown out, the Cafe Royal suffered minor damage and the stone of some of the Quadrant buildings (built 1923-1928) was slightly chipped. Regent Street was partially blocked by debris and water and coal gas mains were damaged. At 7.22pm the outbreak of fire was also reported and the Fire Service requested. The area around Regent Street was closed while repairs were made to the ruptured gas mains. 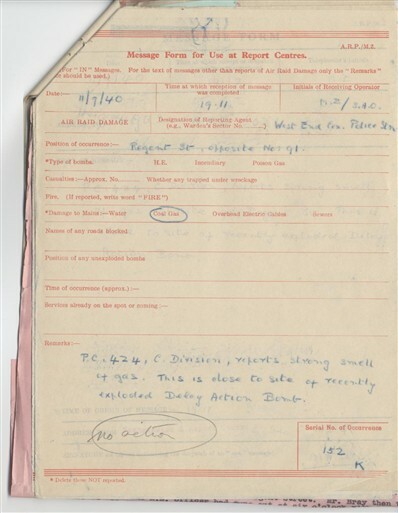 For his actions in reducing the power of the Regent Street bomb, Dr Merriman was awarded the George Cross on 3 December 1940. 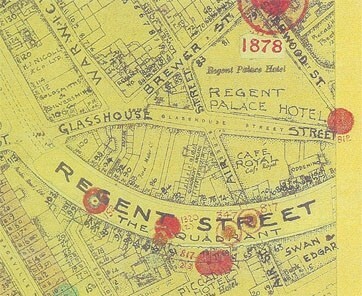 Regent Street was further damaged during the Blitz. 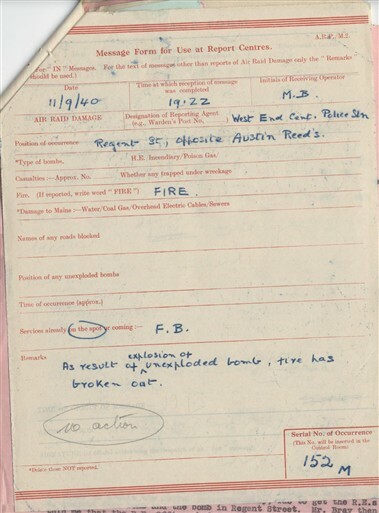 Other incidents included an unexploded bomb which hit and damaged the road surface on the night of 10-11 May 1941. This page was added by Tabatha Parker on 24/03/2011.